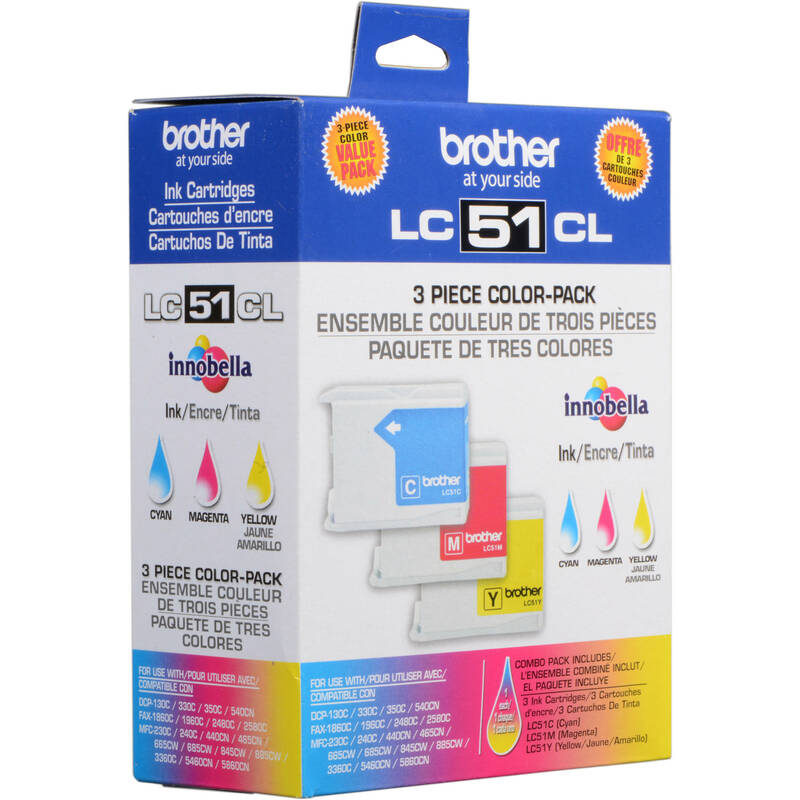 The LC51C, LC51Y & LC51M Color Ink Cartridges (3 Pack) from Brother includes (3) cartridges (cyan, yellow & magenta) in a single package. Each cartridge will yield approximately 400 pages. Buy (3) cartridges in a single package to save on consumables and stock up for future print needs. Box Dimensions (LxWxH) 6.3 x 4.7 x 2.4"
LC-51C, LC-51Y & LC-51M Color Ink Cartridges (3 Pack) is rated 4.4 out of 5 by 9. Rated 4 out of 5 by The Business Improvement Guide from Fast, Good Value I bought printer ink. the price was right, and the service was excellent. They didn't gouge me for high shipping and handling, which I appreciate. They were closed for Shavuot, which was fine with me, as I respect them for putting their faith above their business. Per their offer, I asked for an email when they reopened, but never received one. Other than that, I was very satisfied, and will use them again. Rated 5 out of 5 by triiko from Brother inks I use these inks in a home environment. Like most inkjet packs, they are pricey but B&H had the BEST price on the internet with exception of another .com but they were out od stock. These are the factory inks so I have had no issues with them at all. I am very satisfied with B&H. Rated 4 out of 5 by Anonymous from Reliable, Well-Priced Having experience with Epson, HP, and Brother machines, I can say that Brother seems to do well both in the reliability department and the ink cost one. The 3-pack of color inks, sold as a trio, offer very good (though, as with all inkjets, not great) bang-for-your-buck. Rated 4 out of 5 by Anonymous from Good Ink- expensive, but the best price I love my printer and the ink. It is just very expensive. This was the best price I could find it though, and they shipped very fast. Great customer service! Rated 3 out of 5 by Anonymous from Finally got the right product Looks to be genuine Brother product, but never have had a locally purchased cartridge leak. One of the B&H inks does leak on my paper. Rated 5 out of 5 by Anonymous from Excellent product! great cartridges for my Brother All in One printer! works as excpected. Rated 5 out of 5 by James from Just Great! Great price....on time delivery. Couldnt ask for more.